DHCPatriot 6.3.0 has been released! We will be contacting customers with in-force maintenance contracts to schedule updates of their DHCPatriot systems to this version of software. An updated manual is also available. Contact us today to reserve your upgrade time slot. This entry was posted in DHCPatriot, Updates on March 11, 2019 by admin. DHCPatriot 6.2.0 has been released! This entry was posted in DHCPatriot, Updates on May 22, 2018 by admin. A question for the tinkerers and Makers among you and for those of you catering to the makers in your customer base: Do You Have a Robot in Your Attic? Your local “maker” community may be your most loyal customer base and the source of your future employees! Enjoy your summer, be safe and … Make! I often promote the increasing popularity and value of the Internet of Things (IoT.) Recently, there has been news about the IOT and security. Specifically, articles about how intelligence agencies and hackers, both foreign and domestic, exploit weaknesses in the software of IoT to increase surveillance on an unsuspecting public. Should your customers be concerned? Perhaps. Is there a guaranteed solution? No. But your customers can minimize risk with the same “best practices” that you should use to keep your network secure and running. Beyond using passwords and basic security, the most important thing you and your customers can do is keep software and firmware up to date. That sounds simple enough, yet too many ignore this basic yet necessary step. Exploits, like the ones recently reported, find flaws in specific code (applications, Operating Software or firmware.) Code updates are often issued specifically to address such flaws, once known. Staying current on updates can help keep you one step ahead of the legion of “black hats” who want to exploit your network or information. Devices from your customer’s IP camera or Smart TV, to personal computers, your routers and other network hardware, and especially your servers must be kept up to date if you want even the most basic safeguards from the disasters of hacking. IT and security professionals keep track of such exploits and the patches and updates needed to repair them. The First Network Group Information Technologies division specializes in keeping your equipment up to date as a routine part of providing Server and Network management services. Unsure of the update status of your Network? Contact Randy Carpenter VP of IT Services at 1-800-578-6381, option 1 to arrange an analysis of your Network today. Chromebooks have been around since 2011, odds are you may have used one or at least seen one in a local store. Chromebooks run Google’s Chrome Operating System and tied to the Google application ecosystem. Let’s take a look at some Pro’s and Con’s about using a Chromebook. Pro: Linux-based operating system specifically designed by Google does not need anti-virus or is impervious to 99.999% of malware you will come across. Con: Common PC-oriented applications cannot be used. Including Microsoft Office (desktop), Adobe Photoshop, Mozilla Firefox, etc. However many of these applications have analogous software or lightweight versions available via the Chrome Web Store. Pro: Fast boot times and well known interfaces. If you’ve used the Google Chrome web browser or an Android-powered phone, you will feel right at home with a Chromebook. Con: Limited hardware available. Many times the hardware specs of Chromebooks will be much lower that full-fledged laptops running Windows or Mac OS. However, Chrome OS and applications are so lightweight, that the hardware they ship with is more than capable. Pro: Android Applications are coming to Chrome OS. Google is working on integrating Android apps that run on your phone or tablet to run inside of Chrome OS. Moving from one device to another will continue to become more and more seamless. Con: People heavily integrated into the Apple ecosystem will find very few options on how to interact with their Apple-based applications and sign-in options. Chromebooks can be very powerful devices when utilized correctly and for the majority of day-to-day uses they will fit every need you have. While they can’t fully replace your classic Windows or Apple laptop, they certainly can close the gap nicely. And their price point makes them a fantastic secondary device to keep near the couch, or a first laptop for a child. Did you know that part of the End-User Technical Support services you already receive from us, includes our remote assistance feature for free? We’ve always known that helping a user directly is the best way to correct an issue, so in 2010 we designed and deployed our remote assistance software. This secure and lightweight software is any easy to download and run for any user and allows us to view and manipulate the customer’s computer with them in real time. The biggest surprise of using this tool was not the ease and speed of resolving a customer’s issue, but using it as a way to educate customers to features of their computer or websites one-on-one and at their own pace. This tool has been invaluable in helping us reach our recent one million call milestone! This entry was posted in Call Center, Tech Support on August 1, 2017 by admin. Handling their first support call over 20 years ago, First Network Group, Inc. reaches another major milestone by making their One Millionth support call! First Network Group, Inc. is proud to announce a major milestone in the history of the company– their one millionth call produced by their Technical Support and Customer Care Call Center. Small businesses are judged by longevity and First Network Group has already proven their mettle in that area by surpassing 20 years in business in July 2016. However very few companies can claim the benchmark of one million support calls. If you think you’re on the phone a lot, making one million calls adds up to nearly 400 days of non-stop talk time! The past one million calls have been made been made at First Network Group’s home office, in the small town of Wapakoneta, Ohio. Each one of these calls has focused on providing the special type of warmth and neighborly approach that can only be found in a small Midwestern town. First Network Group has always maintained a customer first attitude, which explains why they’ve been so successful. “We’ve always said, we could support Internet, TV, telephone or whatever, but at the heart of it all was the desire to help make someone’s life easier and more enjoyable through the use of technology,” states Cory Lykins, Vice President of Tech Services. Small town values, a customer-friendly and focused approach and dedication to bringing technology in reach of everyone– it’s clear to see why First Network Group has enjoyed so much success through the years. About First Network Group, Inc.
First Network Group Inc. is a specialist in building and maintaining Internet Service Provider Networks. Based in Ohio, it provides Server Administration, Network Engineering, and 24×7 emergency monitoring to reduce ISP/NSP downtime. FNGi developed and sells the DHCPatriot– a DHCP accounting and authentication server appliance. FNGi has a flexible and robust Call Center that provides multi-product End-user Technical Support Services and Customer Care options 24/7/365. This entry was posted in Call Center, News, Tech Support on July 27, 2017 by admin. DHCPatriot 6.1.0 has entered beta testing! We will be contacting certain DHCPatriot customers to inquire about helping us with beta testing. If anyone would like to help us beta test, please feel free to contact us and inquire about beta testing! Previously ‘Auth DHCP Config -> Exclude IP Address’ did not expose the ‘Limit Displayed Entries’ box. This made searching within the list impossible. This has been resolved. The box now appears and searching of this list is possible. Filesystem trim support is now triggered on boot in addition to once daily. Swappiness is now reduced to 5% on boot. Trim is now activated on the boot flash in model 2013-1 and newer DHCPatriot systems which contain such flash. Comma Separated Value (CSV) exporter will have commas stripped from the fields as this can obviously cause a problem for comma separated value files if there are rogue commas in the file. Performance module from the upper right has been hidden on virtual systems. This due to our inability to predict the hardware available in a virtual environment. Moderate performance bug in Usage Graphs data collection found and repaired. Disabled subnets ip counts now removed from total available IPs. Previously it made no impact on the counts of available addresses or the warnings about networks being full. Sessions will now move with a subnet if a subnet is moved to a different shared network or a different type of DHCP (such as auth -> standard). Some times in the past, a subnet would be moved. Sessions would continue. But they would disappear because they were still tied to the old shared network that wasn’t their home anymore. The sessions would show up in search sessions, but not in the counts on view address usage and the graphs. They still won’t immediately show up even now, but as they renew, the count will become correct. Preliminary support has been added for temperature monitoring. In a future release, the data will be added to SNMP output and server status web administration interface function. On certain systems, syslogd can have a tendency to not restart properly after log rotation. This seems to be limited to VMware systems. To counteract this, detection and starting of failed syslog has been implemented. A problem was fixed in the Built-in Authentication where a response couldn’t be obtained if the user was suspended. This could allow the user to stay online when they shouldn’t have been. This has been corrected. A new backend feature has been added such that authenticated devices are added and removed directly from the DHCP server. This means that a DHCP server restart is no longer required when user devices are authenticated or get suspended. This will result in greater DHCP server availability than is present prior to 6.1.0. Please note that this is a rather substantial change in operation of the DHCPatriot and as such there could be some unknown bugs present. If any are discovered, we will get a patch out as soon as possible. Standard DHCP Actions -> Known Client will now automatically translate any single quote ‘ to a back-tick ` to avoid problems with queries as the entries are used during DHCP actions. Standard DHCP Actions -> Static IP Assignment will now automatically translate any single quote ‘ to a back-tick ` to avoid problems with queries as the entries are used during DHCP actions. API: The API log messages have been enhanced. More descriptive log messages for API actions and failed logins / errors and the like are now available. These can be searched by going to System Configuration -> System Logs and selecting index for the Daemon and entering *API* in the Search Text box. In certain instances, this may impact returned error messages for the API. Please ensure that your API scripts still work after updating. API: The Known Client API calls previously did not properly restart the DHCP server when performing actions. This has been corrected. User Admin Restriction fix implemented. Previously, if you had an auth network selected but no standard, it showed you all standard networks. Also, if you had a standard network selected but no auth, it showed you all auth networks. This behavior has been corrected. Now, if you have at least one from one of the types selected but no other, all of the non-selected networks are hidden regardless of whether they are auth or standard. This makes this feature behave as was intended and per the descriptive text of the feature. Network restrictions are a convenience to hide networks which a particular administrator has no interest in (such as might be the case if multiple companies are sharing a DHCPatriot system). It is located and configured in System Configuration -> Administrators on the web administration interface. VRRP for IPv6 has been added. Set this up under System Configuration -> General Setup in box 14. The IPv6 addresses of the DHCPatriot devices as well as the VRRP address must all be in the same subnet. Corrected various spelling errors in response messages. A new area has been added to configure permissions for the various functions available on the DHCPatriot system web administration interface. We called this Set App Permissions and it can be found under the System Configuration menu. This can be used to adjust the permission levels so that custom administrator levels can be created hiding / showing certain things to various administrator levels according to requirements. DHCPv6 Option 18 and Option 37 are now supported on the DHCPatriot system. They are only supported in the case that they are ASCII text strings (as was the case with option 82 support in DHCPv4). These options will be recorded with the DHCPv6 sessions. DHCPv6 sessions are now being recorded in the database. DHCPv6 sessions are now searchable in DHCPv6 (IPv6) -> Search Sessions. You can search by Client DUID, IP Address (which will also search delegated prefix), options 18 and 37, date/time and show only online devices. Additional parameters shown (Username and MAC Address) are not yet relevant and there for future development. The search results look similar to those available in DHCPv4. A new DHCPv4 setting has been exposed. The One Lease Per Client flag can now be toggled in System Configuration -> General Setup. This flag has always been there and is thus enabled by default. The DHCP server is instructed to allow only one IP Address per client. If a client requests a new lease, the previous lease is released. In 99% of situations this is the desired behavior. Recently, we have encountered a situation with a customer where multiple IP addresses per client is desired. Thus we have exposed this setting. If disabled, a client will be able to obtain and use multiple IP addresses simultaneously. Extra DHCP settings for DHCPv6 have been added to System Configuration -> General Setup. This works in a similar manner to the extra settings for DHCP except on DHCPv6 instead of DHCPv4. A problem was corrected where, under certain rare circumstances, stop time could be one second less than start time causing session time sent to the radius server to be -1 which resulted in session time appearing to be the largest possible positive unsigned 32 bit integer from the RADIUS server’s perspective. session time will now be adjusted to 0 in this case. View Address Usage now appears in DHCPv6 complete with the ability to click the subnet and see a list of users in the subnet. Graphs are not yet present and will appear in a future version. It is now possible to disable subnets in DHCPv6. This works much the same as it does in DHCPv4. The only difference being that Prefix delegations are dependent on a subnet, and so if a subnet is disabled, all of the prefix delegations dependent on that subnet will also show disabled in view address usage. Prefix Delegation has been split off from Dynamic Subnet allocations in DHCPv6. This allows multiple Prefix Delegation pools to be setup per subnet. Access Prefix Delegations in the DHCPv6 (IPv6) -> Prefix Delegation menu item. At time of install of 6.1.x, any prefix delegation pools that are setup with a subnet will be moved to this area. This entry was posted in DHCPatriot, News, Updates on March 19, 2017 by admin. First Network Group, Inc. now offers our own line of FNGi-branded optics. 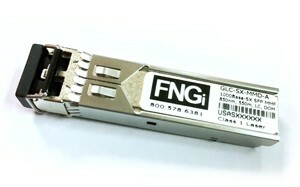 This includes the common SFP optical transceivers, as well as SFP+, XFP, CFP, and more. These are sourced from major manufacturers (the same ones that make the OEM-labeled products) and programmed and tested by one of the leading suppliers in the industry. Custom programming allows these modules to appear the same as OEM models to switches and routers. No more having to issue special commands to get non-original SFPs to function. We can provide direct replacements for existing OEM models. In some cases, we can offer similar models that exceed the distance specifications, or use different wavelengths. Examples include 100+km distance support, Bi-directional optics that use only 1 fiber, and DWDM models. Our optical transceivers have a lifetime warranty. We also provide a full catalog of optical cabling, as well. A variety of lengths, fiber types, and connectors are available. Contact Randy Carpenter for more details and for a custom quote.